The island of Chiloé, in southern Chile, is one of the most important wintering sites for Hudsonian Godwit (Limosa haemastica) and Whimbrel (Numenius phaeopus). The bays, wetlands, and coasts of Chiloé support 21,000 Hudsonian Godwit—27% of their global population, and 99% of their Pacific Coast population. The wetlands also sustain a significant proportion of the Pacific Coast population of Whimbrel. Both species are considered of “high conservation concern” in the Americas, as outlined in the U.S. Shorebird Conservation Plan. In January 2011, the Western Hemisphere Shorebird Reserve Network (WHSRN) Hemispheric Council designated Humedales Orientales de Chiloé (the eastern wetlands of Chiloé) as a WHSRN site of Hemispheric Importance. The dozen wetlands that make up the site cover 1,900 hectares, and were declared a WHSRN site with the support of landowners and administrators, local municipalities, grassroots organizations, and the Chilean Ministry of the Environment. Through the WHSRN Executive Office, Manomet is working to fulfill the mission and objectives of the Network in Chiloé. Thanks to the generous support of the David and Lucile Packard Foundation, the Migratory Shorebird Conservation Plan of Chiloé has been implemented in four phases since the island’s designation as a WHSRN site. The Conservation Plan has enabled the Network to build a foundation in the community and strengthen the process to conserve crucial wetland habitats for these shorebirds. The plan has seven action goals: 1) Strengthen local capacity; 2) Develop management agreements with landowners and aquaculture businesses; 3) Improve local governance for the conservation of critical shorebird habitats; 4) Promote initiatives that integrate conservation and local development; 5) Engage local communities in the conservation of shorebirds and their habitats; 6) Gather key biological information, and 7) Build strategic alliances to support implementation of the plan. This plan is uncovering answers to this question in Chiloé. By developing and supporting a range of local ventures, it has helped create small hubs of development that are connected to bird conservation. The effort to conserve shorebirds has become inextricably linked with the needs of local stakeholders, their lands, and the creativity of the island’s entrepreneurs. The momentum of these ventures has been propelled by tourist activity around critical sites for shorebirds. The archipelago of Chiloé is now a destination in Chile’s network of “Rutas Patrimoniales,” or “Heritage Trails,” a project of the Chilean Ministry of National Assets to enhance and conserve the country’s cultural and natural history through sustainable tourism. One of 65 trails across the country, the Rutas Patrimoniales website draws visitors to Chiloé with the promise that every section of the trail incorporates views of the coastal wetlands that make up the WHSRN reserve site. The Heritage Trail was created under the wings of the Conservation Plan and is proudly promoted by the Ministry of Natural Assets, local municipalities, NGOs, and tour operators. The route is called “Chiloé: Wetlands, Birdlife, and Culture.” That it is irreplaceable habitat for migratory and resident shorebirds is one of its main attractions. Continuing to use the Conservation Plan as a framework, the local partners of the Center for the Study and Conservation of Natural Heritage (CECPAN) and the local NGO Conservación Marina (Marine Conservation), have built capacity by facilitating workshops such as “The Benefits of Conserving Shorebirds,” and activities that honor the rich cultural history between shorebirds and the island’s traditional crafts. This partnership has strengthened local entrepreneurship by supporting businesses along Chiloé’s Heritage Trail. Picture, for example, eating at the grill “Los Zarapitos” in the town of Chullec. Named for the local common name of the Hudsonian Godwit, it is a restaurant that serves the traditional food of Chiloé with a view of the beach of Chullec. The Conservation Plan, through the NGO Conservación Marina, enabled this family business to add a shorebird observation component to its restaurant. In a short time they significantly increased their influx of customers and became a favorite restaurant on the island of Quinchao. Visitors come to enjoy traditional dishes like Curanto or Pulmay while watching the marvelous shapes formed by a flock of 4,000 zarapitos in flight. Another highlight of Chiloé’s conservation story is in Bahía Pullao. Carlos Grimalt is a landowner in the Bay who appreciated the value of conserving shorebirds and their habitats. Taking advantage of the tone that had been set by the Conservation Plan, he decided to take the risk of starting a business. First, he built a basic center for observing and learning about birds on his land. Then he purchased high-quality spotting scopes and installed wooden walkways and lookout points to watch shorebirds on his property. Finally, he built beautiful lodging for guests, giving each room a view of the wetland. All of this came from Grimalt’s own vision and initiative, bringing “Refugio Pullao” to life. Along with the support of local CECPAN partners, this created an incredible new reason for tourists to visit Chiloé. 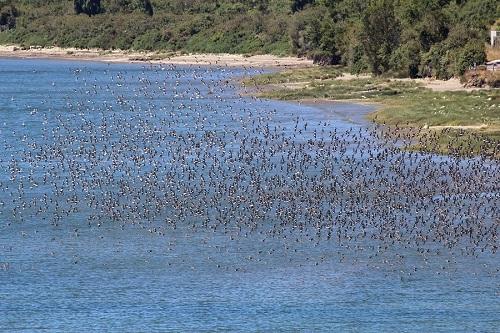 A key factor is that in front of Refugio Pullao, they have been able to record flocks of 7,000 Hudsonian Godwit. In January 2018, Manomet’s Habitat Management Division led a Shorebird Ecology, Conservation, and Management Workshop on Chiloé, bringing together partners from organizations like Conservación Marina and CECPAN, municipal and provincial government representatives from across the archipelago, and private landowners like Carlos Grimalt. The workshop was an important part of Phase Four of the Conservation Plan. After the workshop, the Manomet team visited Refugio Pullao, where they rose each morning to a view of mudflats filled with shorebirds. They ferried across the Bay to join workshop participants at a shorebird festival in the town of Curaco de Vélez. They ate Curanto between visits to wetlands, searching for shorebirds that would soon be heading back to the Arctic to breed. At every turn, they witnessed a community pride for shorebird conservation being woven into the culture of Chiloé. And on their last night at Refugio Pullao, they recorded almost 10,000 Hudsonian Godwit coming in to roost as the sun set over the mudflats.